I think it was Colin Chapman that once said the best VW Cabriolets are all built on the Pontiac Fiero chassis...or was that Smokey Yunick? You won't find that quote in the history books, and both those guys are dead, so you can't verify those quotes -- but if they were alive, I'm sure both would agree that the only powerplant for your Fierrabbit is a GM 3800 V6 with a single turbo put in the place of the original supercharger. 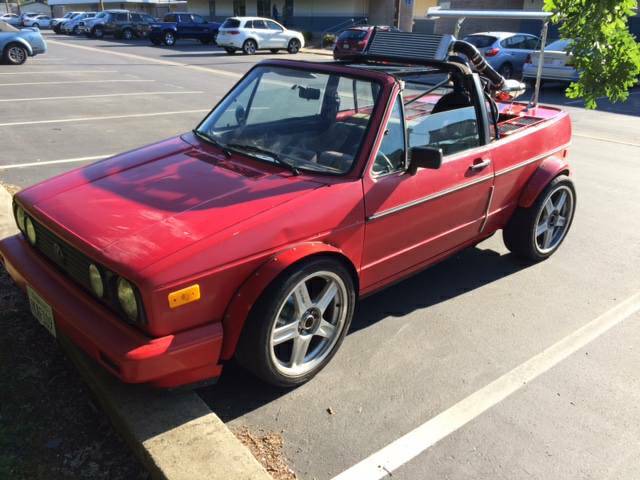 Like this 1979 Volkswagen Rabbit Cabriolet custom offered for $6,500 in Rancho Cordova, CA via craigslist. Tip from Safety Fast. 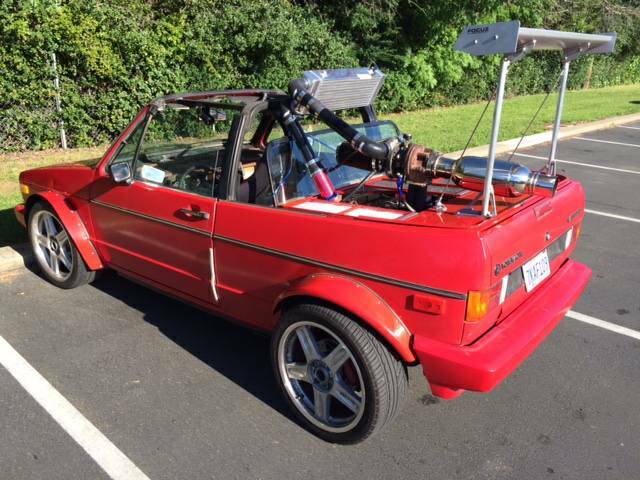 The original Mk I VW Golf Cabriolet has a reputation for being a hairdresser's car, which doesn't make much sense because if you were really into hair you wouldn't want yours exposed to the elements on your commute. This one, however, has been transformed from a front-drive sissy mobile into some kind of insane rear-drive deathmobile. The seller says that the Rabbit is riding on a Pontiac Fiero chassis -- I have no idea how this is accomplished given the unibody nature of the Rabbit, but instead of a rear seat behind the driver, it now has a GM 3.8 liter V6 mated to the rear wheels. 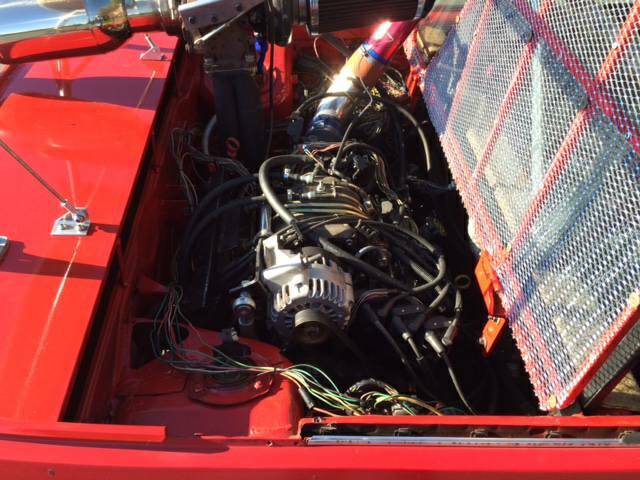 The original supercharger has been tossed in favor of a Holset HX40 turbo mounted a few feet above the engine. 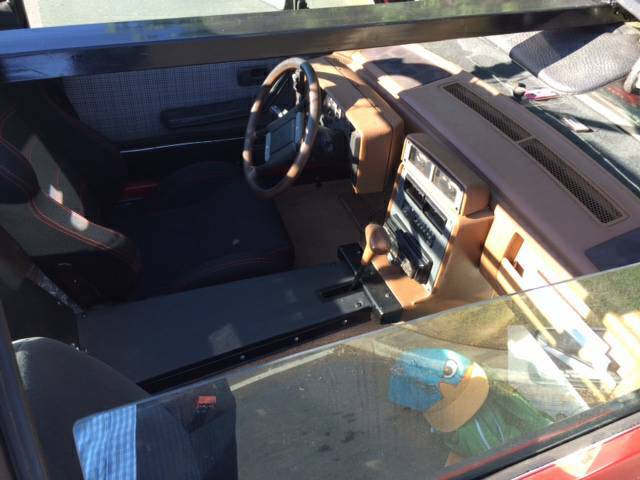 The interior looks suspiciously like a Fiero to me -- so I'm beginning to wonder what is left of the Volkswagen in this custom -- perhaps it is mostly the body panels and VIN tag? You had me at "low-drag expanded-metal scatter shield". Not one, but TWO Frankencars in one day! You guys have outdone yourselves. Looks like it was cooked up by Richard Hammond for an old Top Gear segment. Make a few Sawzall cuts at the A- and B-pillars, throw away the windshield and roof, then slide a gutless Cabrio body down over it. That's how I imagine it went. Stay away from the tarbabies in that Fierrabbit or you will be just begging for a trip the the briarpatch.